Anniversary For J. Edgar Hoover. FBI Chief observes his 40th Anniversary as the nation's Chief Law Enforcement Officer. He receives a bronze bust of himself as one of the many tributes paid to him on the occasion. He is 70 and at the request of President Johnson will continue to head the FBI. Washington DC J. Edgar Hoover and Emit MaGayhe, a former FBI Agent standing in his office. MS - Former FBI Agents attending this small and personal ceremony. MS - Emit MaGayhe unveils a bust of J. Edgar Hoover. CUS - J. Edgar Hoover bust. MS . A smaller bust is handed off to J. Edgar Hoover that he can pass out to his friends and associates. Decorated: FBI Chief Honored for Boys' Clubs Work J. Edgar Hoover accepts Boys' Club award from ex-pres. Herbert Hoover; speaks on problem of Juvenile Delinquency; need for discipline, guidance, and "proper surroundings" for the future of America J. Edgar Hoover addresses the audience: "We who are engaged in law enforcement see the results daily in the ungoverned activities of teenage boys and girls. Who are responsible for a percentage of crime out of all proportions to their age group. This is indeed a serious indictment (audio is untellable). The need for giving American youth what is justly his guidance, training, discipline, proper surroundings, incentive, moral and spiritual development is more important than ever. Before in the history of our nation. The strength, security and the future of America depend upon the character and quality of our youth. 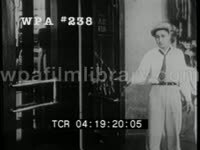 The Harry Dexter White case reaches its climax before the Senate Internal Security Subcommittee, which hears J. Edgar Hoover and Attorney-General Brownell substantiate charges that President Truman knew of White's activities prior to his promotion. Establishing shot - Members of the Senate Internal Security Subcommittee. CUS - Harry Dexter White. CUS - Attorney-General Brownell. Attorney-General Brownell addressing the Senate Internal Security Subcommittee; "The information contained in these reports was as the Subcommittee knows, of great importance at the time White wrote them. Although with the lapse of time the necessity for secracy on these subjects has disappeared. But the record which was available to the Truman administration in December 1945 an thereafter, should have sufficient to convince anyone that White was a hazard to our government. The question which had to be decided at that time was not whether White could have been convicted of treason in court. There was ample evidence that he was not loyal to the interest of our country, and that's enough. Government employment is a privilege, not a right. We don t have to wait until a man to be convicted of treason before we can remove him from a position of trust and confidence". President Truman addresses the people, "The Attorney-General of the United States has not only degraded his office. He has deceived his chief as to what he proposed to do. And in saying Harry Dexter White was known to be a communist spy by the very people who appointed him, he lied to the American people. The charges which had been made to the FBI against Mr. White also involve many other persons. Hundreds of FBI agents were engaged in investigating the charges against all those who had been accused. It was great importance to the nation that this investigation be continued in order to prove or disprove these charges and to determine if still other persons were implicated. Any unusual action with respect to Mr. White's appointment might well of alerted all the persons involved to the fact that the investigation was on their way and thus endanger the success of the investigation". J Edgar Hoover addresses the Senate Internal Security Subcommittee, "At no time was the FBI a party of agreement to promote Harry Dexter White and at no time did the FBI give its approval to such an agreement. Such an agreement on the part of the FBI would be inconceivable". President Truman addresses the people; "The Attorney-General of the United States has not only degraded his office. He has deceived his chief as to what he proposed to do. And in saying that Harry Dexter White was known to be a communist spy by the very people who appointed him. He lied to the American people. The charges which had been made to the FBI against Mr. White also involve many other persons. Hundreds of FBI agents were engaged in investigating charges against all those who's been accused. It was great importance to the nation that this investigation be continued in order to prove or dis-prove these charges and to determine if still other persons were implicated. Any unusual action with respect to Mr. White's appointment might well of alerted all the persons involved to the fact that the investigation was on their way and thus endanger the success of the investigation". Bold Ruler Wins Preakness. Bold Ruler, after a letdown in the Derby, redeems his claim to turf greatness with a brilliant victory in the 81st running of the Preakness Stakes at Pimlico, beating Iron Liege by 2 lengths. Spectators stand to watch. Seated for the race are two men, one of whom is FBI Director J. Edgar Hoover. Also in attendance are John Eisenhower (President Dwight Eisenhower's son) and Milton Eisenhower (the President's brother). Horses come out of the gates as race begins. White man wearing hat looks through binoculars; if he weren't at a horse race, I'd think he was a private detective. Various other shots from race. Slow motion of jockey Eddie Arcaro riding Bold Ruler across the finish line, urging the horse on with the crop. Flowers for the winning jockey and horse. Elderly couple pose with trophy, the man might be owner Sunny Jim Fitzsimmons. President Eisenhower presents the Young America Medal to 14-year old Patricia Ann Strickland of Atlanta, Georgia. For her courage in rescuing her mother from the flaming wreckage of a light plane 2 years ago. Establishing shot - President Eisenhower present an award to Patricia Ann Strickland, CUS - Certificate of Award. CUS - Of Patricia's mom. CUS - J Edgar Hoover, smiling. CUS - Young American Medal. CUS - Patricia Ann Strickland. Twenty-five Years Ago Henry ford, famed motor magnate, went back to school at his reconstructed village where his boyhood school was rebuilt. Ford walking with another men, two little girls follow them. Men, women and children seen going into school house. Ford shows a young boy where he carved his initials "HF" into a desk. The man who made the FBI famous J. Edgar Hoover, received one of his innumerable citations - this one from the boy scouts. CU Hoover speaking at dinner. Secretary of State Hull sailed for South America and a peace conference. He was in the office at the time of Pearl Harbor. Sign: 'Secretary Hull you are sailing on a Scab manned Ship'. Hull and wife? at press conference. Press, photographers, flash bulbs. 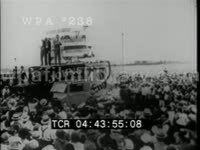 Large passenger liner, or ship leaving dock, people waving handkerchiefs. The Papal, secretary of state, Eugenio Cardinal Pacelli visited the United States. He later became Pope Pius XII. Women greet Papal kiss his hand and courtesy. A reporter Dorothy Kilgallen raced around the world on scheduled airlines. She made it in 24 days, but a rival made it in 18. Night footage - Press, photographers huddled around door of small plane. Could be used for any celebrity, personality arrival. Dorothy poses with family. Every era has its fads and fancies. 25 years ago it was painted stockings and the girls had themselves out on a limb - or two. Women have their legs painted to appear as though they are wearing stockings. Women seated as men paint their legs. CU women s faces as they watch, including platinum blonde. CU of styles and creations. Women standing in line, with skirts hiked up showing off fashionable fad. News in Brief: Scouts In The News. "In Washington, D.C., the Boy Scouts of America present a report of their year's activities to the President, their honorary leader. The Cub Scouts honor F.B.I. Chief J. Edgar Hoover, making him an honorary member." Scouts sit with US President Dwight Eisenhower, give him gifts. A Cub Scout shakes hands with Hoover and pins something on his lapel. MS/MCUs Federal Bureau of Investigation Director J. EDGAR HOOVER sitting at a desk in an office, signing paperwork, answering telephone. MS/CUs FBI Director J. Edgar Hoover talking with a FBI agent while standing in front of a large map of the United States; Hoover points to geographic locations (map displays capital cities and some sort of population gauge). TLS FBI Director J. Edgar Hoover sitting at desk, talking with two FBI agents. MSs J. Edgar Hoover signing paperwork, answering telephone. TLS J. Edgar Hoover talking with two agents seated before him in his office. MSs Hoover talking on telephone. More shots of Hoover talking with agents, talking on phone, reviewing papers in office. MS/CUs lettering on glazed glass office door: "J. Edgar Hoover, Director, Federal Bureau of Investigation, Entrance." Exterior of FBI Headquarters (Department of Justice building). MS sign: Federal Bureau of Investigation. MS door: J. Edgar Hoover, FBI Director. J. Edgar Hoover working at desk. MS FBI agent flipping through mug shots. 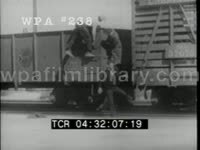 MSs FBI agents on firing range, using pistols and rifles; C/As of target of Dillinger being shot up. Dealers in Death Part 1 - FBI Shots of FBI agents showing off seized guns and automatic rifles. 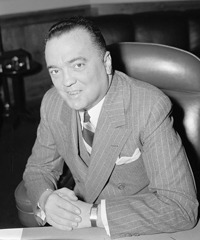 MS FBI Director J. Edgar Hoover testifying to Congress. J. Edgar Hoover in office. Shots of FBI agents going through files and fingerprints.